Abby Sunderland's Sailboat In Doomed Record Attempt Is Found Off Australia "My heart skipped a beat. It brought back many memories — good and not so good": Seeing her boat Wild Eyes brought back a flood of emotions, says Abby Sunderland, who's now 25. The hull of Wild Eyes — the sailboat Abby Sunderland used in her attempt to sail around the world solo — was found drifting off Australia's Kangaroo Island. 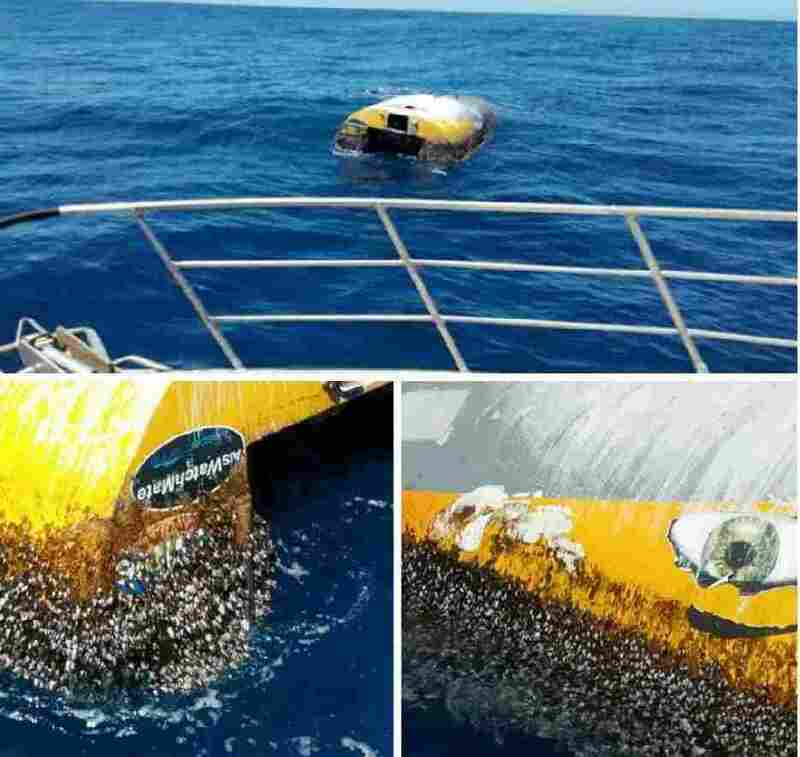 Wild Eyes — the sailboat abandoned by American Abby Sunderland in her failed bid to circumnavigate the world solo as a 16-year-old — has been found floating off of Australia's coast, nearly nine years after she was rescued in the Indian Ocean. Seeing her boat again brought back a flood of emotions, says Sunderland, who is now 25. "My heart skipped a beat. It brought back many memories — good and not so good — but it was neat to see it after so long," she said, according to Australia's ABC. "It looked a little creepy, but that's to be expected after so long." The capsized sailboat was noticed by a tuna-spotting plane roughly 11 miles south of Kangaroo Island, the South Australia Police said. That triggered a call for a helicopter and two nearby fishing boats to check out the craft; on the hull, Sunderland's distinctive paintwork was clearly visible above a thick coating of barnacles. Sunderland had been vying to become the youngest person to circumnavigate the world solo when she set out from her native California in early 2010. She sailed for thousands of miles, but brutal storms between Africa and Australia snapped her mast. A search plane found the young sailor after nearly 24 hours of being tossed around in the sea in her crippled boat — and when a French commercial fishing vessel rescued her, Sunderland's boat was left behind. Today, Sunderland is married and lives in Alabama; she's the mother of three kids, with a fourth expected soon. Sunderland added, "I always knew the boat was high quality and very safe, so it doesn't really surprise me that it's still floating." Upright or not, captained or not, Wild Eyes probably completed its around-the-world trip on its own, says oceanographer David Griffin. "There is every chance it has done a lap of the world already and is on its second time around," Griffin told Australian newspaper The Advertiser. "Eight or nine years is far too slow for a direct trip," said Griffin, who has advised search crews looking for the lost Malaysia Airlines Flight 370. "The simulated particles used in our search for MH370, which sounds like it is in a similar kind of place, have done a lap already." Sunderland's solo attempt set off spirited debates over whether minors should be allowed to try to set perilous records. Questions also arose about the expense and risks of finding and rescuing her. In response to critics, Sunderland noted that she had been sailing for years — and that she had navigated through the Pacific and Atlantic oceans, and rounded both South America and Africa, before weather ruined her boat. Just one year earlier, she added, her older brother, Zac, had completed his own circumnavigation. "My mind was drifting through all the memories of my trip, my team, my boat, my family ... standing there in the dark for hours, thinking back to the terror of tying myself onto a broken stanchion with my saw in hand and working on sawing away my mast hoping I didn't fall off the pitching deck." "All those amazing days racing along surfing down giant swells making record speeds. Sitting on deck with Charlie my stuffed pelican, watching the sun set, icy wind hitting you in the face, feet and hands numb from the cold, but an amazing sight that I got to see almost every night. "The worst thing to think about was all those great times, they were all gone now and my trip was over, no more sunsets on Wild Eyes, no more surfing, no more world adventures. It was hard." With Wild Eyes found, her father said he shares his daughter's curiosity and sentiments about the boat — but that as a family, "We've all moved on." Still, Laurence Sunderland said that when he and Abby began texting about the discovery, "She wanted to know if it could be fixed up — just joking, of course." In South Australia, the government has issued a mariners' warning to beware of the partially submerged sailboat, giving its last known position and urging "extreme caution." Despite its status as a navigation hazard and abandoned vessel, Wild Eyes will be left to drift; officials say they won't interfere with it unless it threatens other watercraft or washes ashore.